We maintain two printer on 4E: Juntonian-II and Enforcer-II. Juntonian is located in the Goodale Lounge. Enforcer moves around. Printer information can be found in the table below. Click the system menu. Select Administration then printing. Double click on Add Printer then fill out the dialog boxes as shown below. 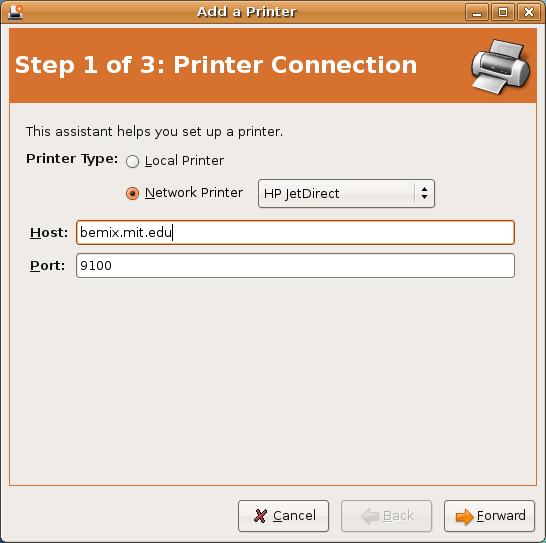 If you are on the internal network, replace "bemix.mit.edu" with "juntonian.bemix"
Go to Print & Fax under System Preferences and add a new printer. The dialog should be filled out as shown below. If you are on the MIT network, replace "juntonian.bemix" with "bemix.mit.edu"
Next choose to create a new port of type "Standard TCP/IP Port"
A new window should pop up, hit next and enter bemix.mit.edu as the printer name. If you are not on the MIT network replace bemix.mit.edu with juntonian.bemix. There should be a slight delay as Windows tries to autodetect the settings but fails. It will ask you to select the type of Device. Choose "Hewlett Packard Jet Direct"
There will be another delay as Windows creates the port. Hit finish to close the window. 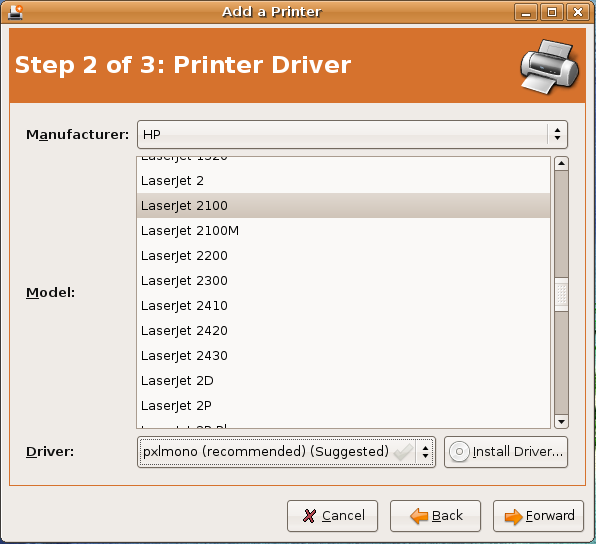 Next the Wizard will ask you to select the printer driver. 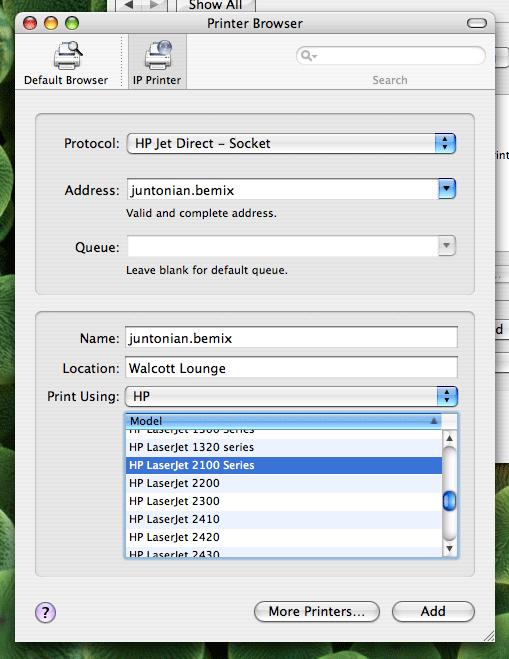 Select "HP LaserJet 2100". 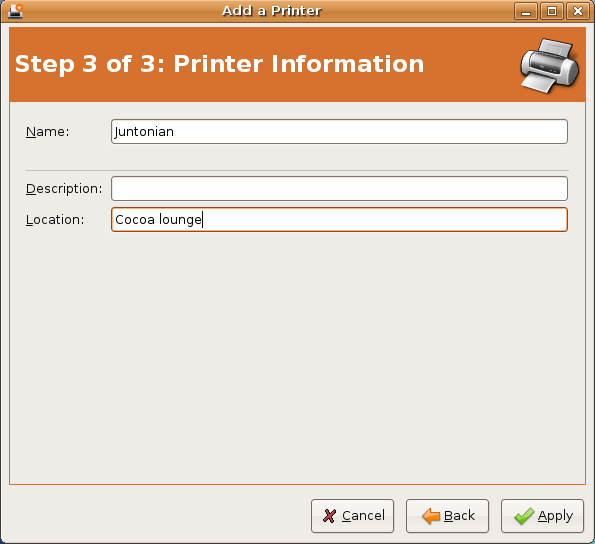 It should ask you what you want to name the printer, call it something useful like "Cocoa Lounge" or something. My-junt stores the music for bemix. There are two samba shares on the internal network, music and uploads. Music is the central music repository. Uploads is where you put music you want to make availible to bemix. Follow the directions below to use my-junt.bemix. The username is bemix and the password is the top work on the pipe in the corner of the Walcott lounge. Go to Finder and click Connect to Server in the Go menu. For the server address enter smb://my-junt.bemix;bemix@my-junt/music. Repeat the process with smb://my-junt.bemix;bemix@my-junt/uploads. Open any folder and type \\my-junt.bemix\music in the address bar. Open another folder and type \\my-junt.bemix\uploads. Note: we have had some trouble connecting to my-junt on a windows computer.